Gov. Jerry Brown signed a clean energy bill Monday and put the state on a path to move the generation of electricity completely off fossil fuels. SB 100 requires California’s utilities to generate 60 percent of their energy from wind, solar and other specific renewable sources by 2030, a 10 percent increase to the current mandates. The bill also requires 100 percent fossil-free sources used to generate electricity by 2045. Approval of the bill comes in the wake of a report detailing the effects of climate change on California. The state is facing a loss of up to two-thirds of its beaches to erosion and two-thirds of its water supply generated from the snow pack, according to the report. Last year, Hawaii became the first state to commit to 100 percent clean energy. 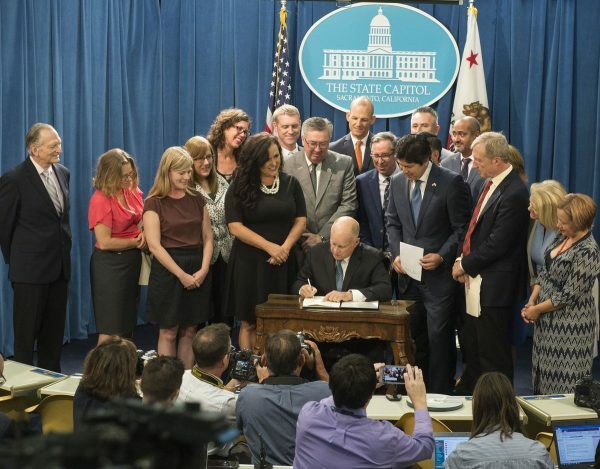 At the signing ceremony, Brown announced an executive order directing California to achieve carbon neutrality by 2045. Carbon neutrality refers to achieving net zero carbon emissions by balancing a measured amount of carbon released with an equivalent amount sequestered or offset, or buying enough carbon credits to make up the difference.